It’s about a month ago. I’m standing at the top of a hill in the summer heat in Togh village. In front of me is a small, house-shaped church made out of light colored stones, surrounded by ancient gravestones and yellow-brown grasses waving lazily in the wind. Looking out, I can see the village houses scattered below me, and low mountains and plains spreading into the distance. My friend is standing slightly behind me with a plastic bag and a kitchen knife. His mom stands next to him, and my mom in front of her. I am standing straight, looking out at the village below me...holding a live rooster in my right hand. Our friends, the Sargsyans, have adopted us into their family and are doing the matagh with us. We walk around the church three times, using the ancient Armenian ritual to bring us into a more mindful and spiritual state. Once we finish, a male relative comes out to kill the rooster quickly on one of the stones outside the church. We go into the church to light candles, sending up a prayer with each one. We are healing. This practice of sacrifice, called matagh, has existed so long that it was a ritual in Armenia’s ancient religion. When the country converted to Christianity in 301 AD, the church embraced this practice, redefining it as a way for believers to remember and focus on the blessings in their lives. It is often done after traumas, such as the illness of a family member, or around major events, such as marriages or births, so that the sacrificers can gain strength and healing through the act of giving. A matagh can be done by a person, family, or group. The sacrificers must then pick an animal: a rooster, sheep, bull, or dove, and pay a fair price for it. This is essential since for those sacrificing an animal, the money that they pay is the main thing that they give up. After that, they kill the animal in a sacred place, often on the steps of a church. This allows us, especially those of us who don’t usually see our meat before we cook it, a chance to see the life that is given up for us, and to appreciate that blessing. The location of a matagh has an important significance in the ritual. We did ours in the yard outside of a church, on the border between a sacred and ordinary space, as well as a border between a natural and a human-created space. This liminal space allows matagh to act as a ritual, allowing ordinary people to access the sacred, and connecting the natural and human-created elements of people’s lives. In addition to the area outside a church, matagh is done in locations thought to have been sacred in pre-Christian times. Last year we visited a sacred grove used for matagh. Although Saro, our host and local Artsakh expert referred to it as a “pagan sacral place,” it was consecrated, not only with natural beauty, but also by a cross-stone, blackened by the many candles people had lit on it. 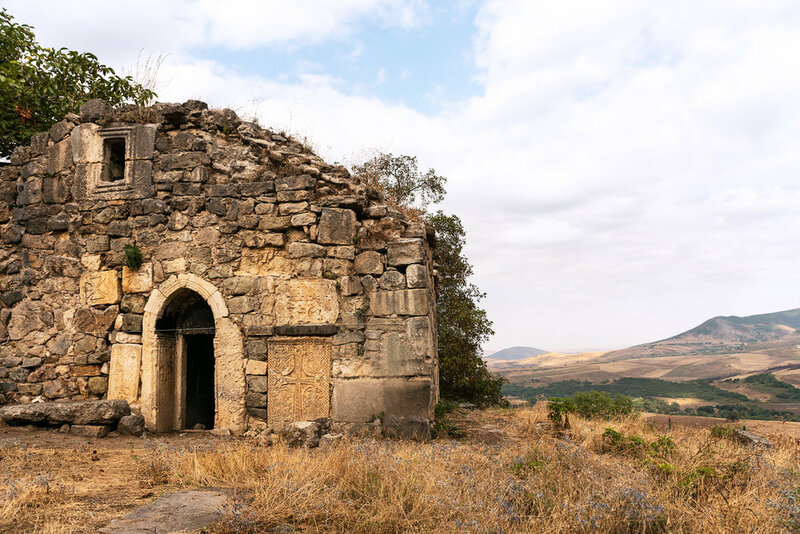 These spaces share the liminal quality of the area outside a church, adding in a significance as a bridge between the pagan and Christian elements of Armenia’s culture, allowing the people to connect both to achieve spirituality. After the animal is killed, it is cooked using boiled water and salt. The salt is also symbolically important, as it is blessed by the priest, and thus makes the meat a sacred food. In fact, the word matagh is made up of two words - matutsel, to serve, and agh, salt. It is given to a number of families - three for a rooster, seven for a sheep, and forty for a cow. All of these numbers have biblical significance (ie. three days before Jesus rose again, seven days to create the world, forty days of fasting), which designates the gift as an essential and sacred part of the sacrifice. Matagh encompasses many variations, such as villages where the sacrificers partake in the matagh meal, or diaspora communities where the sacrifice is done with meat bought from a store, but the act of giving something of yours to someone else without expecting any repayment is what ties them all together. However, sacrifices are difficult to make if we only see them as losses to ourselves. Taking this into account, the ritual of matagh transforms the sacrifice into an act of self-care, one that heals you and gives you strength to take on life’s challenges. It takes you out of your ordinary life and engages you in an action that connects you to God and to others. This allows you to be mindful and feel gratitude for the gifts that you have been given, and that state of mind is what creates greater personal strength. It is vitally important for those of the Armenian Christian faith, but whatever faith you have, it is an important reminder that you can help yourself by focusing on gratitude and giving to others.